1. 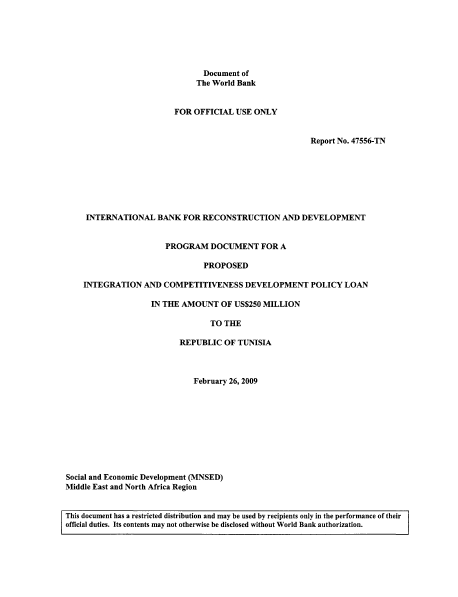 This Program Document proposes an Integration and Competitiveness Development Policy Loan (ICL) for Tunisia in the amount o f US$250 million. This ICL supports the key strategc elements o f Tunisia’s 1 I* National Development Plan (2007-1 1) which seeks to strengthen growth and ensure that this growth i s translated into employment. 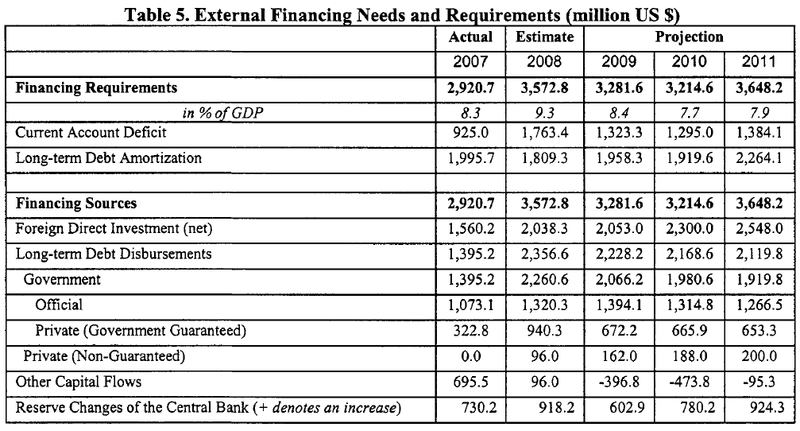 It is also a cornerstone of the World Bank’s program in Tunisia as outlined in the Country Assistance Strategy (FYO5-08) and the Country Assistance Strategy Progress Report (2007) that set out an indicative program for FY09-10. This operation is also expected to be a major component o f the new Country Partnership Strategy (FYIO- 13). The main thrust o f the program i s t o continue growth-enhancing reforms anchored around a deeper integration o f Tunisia to the global economy. More urgently, the ICL will assist the Government in responding to the global financial crisis which i s beginning to expose Tunisia’s inherent macroeconomic vulnerability to growth in Europe. The immediate objective o f the Government i s therefore to accelerate reforms, send a strong signal to investors and mitigate recession contagion risks in the coming years. The global financial crisis and economic downturn will no doubt drive policy changes in Tunisia’s main competitors for direct foreign investment and trade. 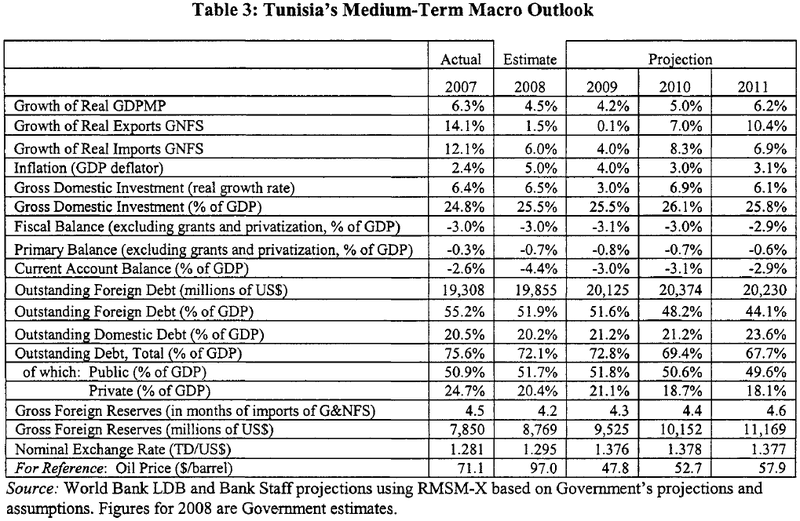 Tunisia has decided to respond by accelerating reforms to maintain i t s competitiveness. 2. 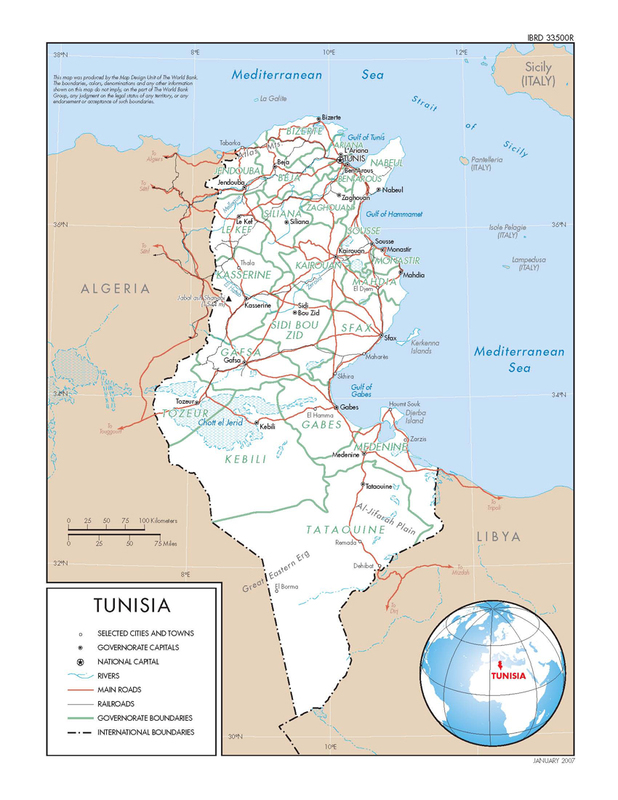 Tunisia i s a small open economy that is permanently facing challenges from developments in the world markets. So far, the country’s global integration strategy has worked well: in 1971, to reduce the anti-export bias inherent in the heavy protection o f the economy, an offshore sector was created. This triggered a rapid rise in FDI and the birth of a large labor-intensive textile industry integrated vertically with the EU’s production networks. In the middle o f the 1990s, trade protection vis-a-vis the EU was scheduled for gradual and systematic dismantling, as part o f the Tunisia-EU Association Agreement (AA). Trade liberalization was accompanied by a wide ranging structural reforms supported by the World Bank. A recent Bank report shows that while a new generation o f reforms i s needed, past integration efforts have led to new exporting sectors emerging in both manufacturing (automobile electrical and mechanical components) and services (business process outsourcing, BPO). That study also found that Tunisia’s economic sectors which are highly integrated to the global market have been able to attract investment, converge to EU’s labor productivity standards, and boost job creation. The country’s average annual economic growth of about 5 percent in 1996-2007 clearly owes much to the Government’s solid macroeconomic and integration policies. 3. Tunisia now faces two interrelated challenges. First, it needs to grow at a much faster rate than in the past to reduce high unemployment (14 percent). Tunisia’s second challenge i s the need to accelerate the structural transformation o f the economy from a low-wage, labor-intensive economy to a knowledge-based, shll-intensive and technology-based economy. For a small economy, meeting both challenges requires deeper global integration, i.e., finding niches in global market for Tunisian products, tapping into global knowledge, technologies and investment, and further reducing protection at home to enhance resource allocation and efficiency. In i t s 1 l* National Development Plan (2007- 2011)t,h e Government clearly reaffirms i t s objective to deepen and widen the global integration o f Tunisia. Operationally, this means shifting away from just facilitating the economy’s adjustment to openness (supported by a series o f four Bank structural adjustment loans in the past) towards a more ambitious and deeper global integration agenda. 4. The proposed ICL focuses on a set o f mutually reinforcing policies and actions to deepen Tunisia’s global economic integration and to promote private sector development. It proposes a selective focus on three key policies areas o f the Government’s reform agenda where the Bank and the other development partners can bring the most value added, specifically: (i)re ducing trade transaction costs and deepening Tunisia’s global economic integration. This involves both the move to a more global (i.e., non-preferential) integration and a deepening o f the Association Agreement (AA) with the European Union to converge to EU safety and security norms and standards; (ii)F urther improving the business climate to enhance competitiveness o f T unisian firms, including services and; (iii)E nhancing the development o f the financial sector to increase its capacity to finance private investment. By supporting reforms in these areas, the program would contribute to growth and macroeconomic stability. It would also contribute to the Government’s structural reform in response to (i)in creased global competition and reduced trade protection, and (ii)t he transition to an economy based on knowledge, innovation and diversification. 5. While this ICL i s a stand-alone program, the dialogue around i t s content i s de facto programmatic and it is likely that the Government will request another DPL at the end o f this one. The program i s jointly supported by the World Bank, the African Development Bank and the European Union and the three institutions have jointly worked with the Government to design the program within the framework of the 1 l* National Development Plan (NDP).